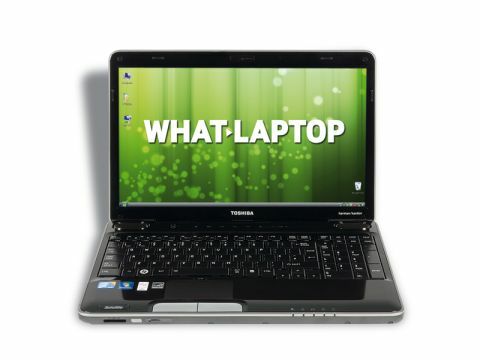 Toshiba's Satellite A500-17X is the company's mid-level multimedia machine, offering similar features and performance to its high-end Qosmio range at a more affordable price. The 16-inch widescreen display lags behind in terms of image quality. Although the colours are bright, it lacks the vibrancy of the Sony and Acer. The resolution is also a lot lower – 1366 x 768 pixels – so you won't be able to view high-definition (HD) movies in their full resolution. It's fine for daily use, however, with more than enough space to view several documents simultaneously, and the 16:9 aspect ratio is great for standard definition films. The 3D performance belies the reasonable price tag, with the powerful, dedicated Nvidia graphics card handling the latest games with ease. You'll also have no trouble with multimedia tasks. The wide aspect ratio creates plenty of space for a large keyboard and a numerical keypad. The keyboard offers impressive levels of comfort, with the glossy keys proving large and responsive. While there's a slight flex to the board when typing, it's still a great choice for long periods of use. There's no backlighting in place, however. The chassis isn't the most portable we've seen, but offers excellent quality. The plastics are tough enough for daily use and there's no sign of flex from the chassis. At 2.9kg, it's too heavy for regular travel, but it's fine for occasional travel use and the three-hour battery life is reasonable enough for short journeys. The 2.13GHz Intel Core 2 Duo processor and 4096MB of memory offer outstanding performance and multiple applications are able to run smoothly and with little lag. Feature-wise, this machine is let down by its lack of a Blu-ray drive – falling behind other machines of this type. There is a DVD/CD rewriter, letting you back up you files to blank discs, however, and the 500GB hard drive offers plenty of storage space for movies and photo collections. There's also an eSATA port offering fast connections to external hard drives. Four USB ports make it easy to connect your peripherals and 802.11n Wi-Fi and Gigabit Ethernet provide the fastest network connectivity currently possible. Although you won't be able to enjoy Bluray movies, you can download HD content from the internet and use the HDMI port to connect to HD TVs. With a reasonable price, the Toshiba Satellite A500-17X has a lot to offer those on a tighter budget. 3D and office performance is excellent, and there's also a good range of features on offer. You should look elsewhere if HD playback is a priority, however.